Sound Oasis is a unique sound masking and tinnitus therapy machine that allows you to create a personalized sound environment conducive to relaxation, sleep, and improvement of everyday life both at home and in the office. By bathing a room with authentic sounds of nature, the Sound Oasis can block out irritating noise, help circumvent tinnitus discomfort, and create a peaceful atmosphere so you can fall asleep more quickly and get higher quality sleep so you feel more alert and rested throughout the day. Sound Oasis can also be used during waking hours to enhance concentration while at work or study by masking irritating noises that interfere with your life. Sound Oasis incorporates the world's only Sound Card Technology, which enables you to add new sounds to your Sound Oasis simply by inserting a sound card, each with a different collection of 6 different sounds. The Sound Oasis incorporates a multi-position timer (with 4 selections: Continuous Operation, or Shutoff in 30, 60, or 90 minutes), a rotary on/off volume control, stereo headphone jack, and a large easy-to-reach one-touch off/resume button that stops the unit or resumes your last played sound. An omnidirectional reflective speaker projects sound from the back of the unit for rich, deep sound that fills your room. The unit can be conveniently mounted to a wall, used flat on its back, or in an upright position for minimal use of table space. The Sound Oasis can be powered by 4 batteries (not included) for extra convenience when traveling, or by an AC adapter (included) for use at home or at the office. Ocean Surf - The ocean surf provides a calm rhythm that helps you drift off to sleep or creates a relaxing Oceanside environment. Stream - A rippling mountain stream helps you unwind and creates an excellent background sound for daily activities in the home or at the office. Rain - A tranquil rainfall provides a peaceful setting for relaxation and sleep. The shower sound is particularly good at masking higher-toned background noise. White Noise - The steady flow of a cascading waterfall is perfect as a "natural white noise" for masking unwanted background sounds and for enhancing speech privacy. Summer Night - A gentle chorus of crickets provides a peaceful and restful environment. Wind - Dramatic but calming gusts of wind sweep you away to a wilderness retreat. Get a World of Sounds with Sound Cards! In addition, the unique Sound Oasis Sound Card Technology enables you to play a new set of sounds simply by inserting a memory card. Sound Oasis Sound Cards are the world's first memory cards to allow you to expand a single white noise machine's collection of available sounds! Four cards are currently available, for a total of 30 individual sounds! If you need help concentrating at your desk or you need to study in a noisy dorm room, we especially recommend the Sound Oasis Office Isolater Pack which includes a set of Microbuds Isolation Earphones you can plug into your Sound Oasis Machine and a 12' earphone extension cord, along with a Sound Oasis White Noise Masking Machine. With the noise blocking Microbuds you will experience a 75-90% reduction in the noise you now hear and you can then play as much of the Sound Oasis sound of your choice as you need to mask the remaining noise that is bothering you, for the best isolation from irritating noise you can buy at any price. By popular demand, you can now plug in your Sound Oasis System anywhere in the world. Just order the optional Global Connector Power Pack below. 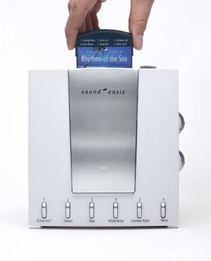 Sound Oasis Sound Card for Standard Sound Oasis White Noise Machine - Four Titles to Choose From! Select any one of the four available Sound Cards for the Sound Oasis Relaxation System. Note: These cards will fit only the new machines we sell and will not work with older Sound Oasis machines. If your machine does not have the part number on the battery cover, these cards will not work. This Office Isolator Pack includes one Sound Oasis White Noise Machine, One set of Microbuds Isolation Earphones and one 12' earphone extension cord. Highly recommended for cubicle dwellers, college students in dorm rooms and others who need to block out the noise around them so they can concentrate. Sound Oasis S-550-04 White Noise Machine Sound Masking System (Free Ground Shipping! )5Midge RidgwayMay 4, 2017This is one of the best white noise machines I have ever purchased, a variety of pleasant sounds that are loud enough to block unwanted outside noises, so I can finally get some sleep at night. I love the sounds that I ordered for the machine, this is a great little device for those who live in noisy environments with rude people, especially at night. Very portable and I love volume control and timer dials, definitely recommend, two big thumbs up! Sound Oasis S-550-04 White Noise Machine Sound Masking System (Free Ground Shipping! )5KristyMarch 4, 2015I bought this about 6 months ago, and love it. We travel a lot, and we take this every where we go. I also love that you can plug earphones into this. It's been a life saver on nights when my husband is snoring just a bit too much. Sound Oasis S-550-04 White Noise Machine Sound Masking System (Free Ground Shipping! )5LynnAugust 30, 2013I like that I can plug head phones into this machine, my other machines did not have this feature.